Mentoring is a value-adding relationship process where a person supports another’s growth. Mentors build people up and pull them toward their own dreams rather than push them. Relationships are not based on expectations, instead mentors seek to understand and support the mentee’s life purpose and goals. While coaching and sharing of personal experience is important, it is more about listening, reflecting and guiding. I can assess a mentee’s needs (listening, probing) and then offer perspective (knowledge, tools, resources) to support the mentee’s growth. Be Available Attentively. Uses active listening; is “in the moment”, concentrating on the needs of today. Ask Powerful Questions. Asks open-ended and insightful questions, causing the mentee to think. Make Empathy a Habit. Places themselves in the situation of the mentee allowing feeling to be transmitted. Offer Insightful Affirmations. Offers positive feedback on a character trait, skill or accomplishment. Help people see their “treasure”. Discover Vision & Goals. Uses a Vision & Goals Worksheet using “heart, mind, body and soul” as a context. Goals are set. Uncover Beliefs. We become what we think and believe. If we uncover our beliefs, we can choose to change them. Talk the Truth. Gives constructive feedback. Be direct when needed to see reality. Support Decisions Based on Principles. Helps identify the key principles (or values) that lead to a preferred decision. Show that choices have consequences. Use the GROW Model. 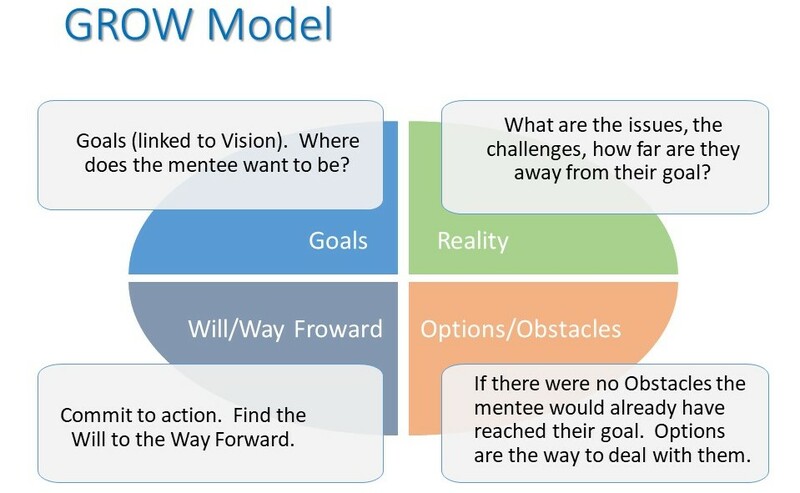 Can use a coaching model to guide the entire mentoring session. GROW = Goals, Reality, Options/Obstacles, Will/Way Forward. Mentoring is a way to help someone reach their potential because encouragement and feedback are essential for growth. A mentor should focus on the purpose, goals and needs of the mentee, not try to impose a personal value system. Role modeling Jesus is an incredible way to think about your mentoring relationship. Ask, what would Jesus do? Read the book, The Heart of Mentoring (see the book list below). Talk to someone who is a mentor and discuss their experiences. Join an organization that uses mentoring in their program. This is a good way to get initial training and ongoing coaching. Become acquainted with the Life Solutions Network life skills wiki. Attend the Mentoring 101 Workshop if possible. Explore different mentoring styles and learn to adapt to each unique individual. Active listening for understanding and relationship building. This helps to identify focus areas and discover strengths. Affirmations to reinforce character strengths and build confidence. Constructive feedback to encourage growth. Advice on options for important personal decisions (rather than directing to a preferred solution). The right process is what works for you. Typically male-to-male or female-to-female, meeting on a set schedule (maybe monthly) in as setting that is comfortable yet effective for private conversation. Characteristics of a good mentor. Mutual trust and respect, listening, “heart” (caring, empathy), life or work experiences. See Characteristics of a Good Mentor or Coach for more. Mentoring at work or in life. There are many life roles that have the opportunity to mentor including parents, managers or friends. These roles are broader than mentoring but hopefully regularly include it. Everyone deserves a mentor. Mentoring vs Coaching. Mentoring is a relationship-based process, pulled to goals set by the individual. Characteristics include inspiration, motivation, and information. Coaching is push-based and skill-driven based on external needs. Characteristics include performance, capability, and training. A typical mentoring session might include both. Structured vs, unstructured mentoring. Unstructured mentoring starts with asking the mentee about their needs. The intent is to focus on adding immediate value for the topics of their importance. There is no planned agenda. Structured mentoring is usually focused on a topic and can be supported by reference material, e.g. spending some focused time on time management or goal setting with an intent to build a skill. Types of mentoring. Responsible mentoring can take many forms: traditional mentoring (one adult to one young person); group mentoring (one adult to as many as four young people); team mentoring (several adults working with small groups of young people, in which the adult-to-youth ratio is not greater than 1:4); peer mentoring (caring youth mentoring other youth); and e-mentoring (mentoring via email and the Internet). Source: Mentoring.org. GROW Model. The GROW acronym stands for Goal, Reality. Obstacles or Options, Will or Way Forward. It is a process to guide a mentoring conversation. Why do you want to mentor? How could mentoring be helpful in your own life? What life experiences and capabilities do you have that enable you to be a good mentor? Mentoring Principles and Skills Assessment. Mentor. Noun: an experienced and trusted adviser. Verb: advise or train (someone, especially a younger colleague). Synonyms: life coach, guide, confidant, advisor. Mentoring.org The National Mentoring Partnership (MENTOR) is the champion for expanding quality youth mentoring relationships in the United States. Search Institute. Search Institute® has been a leader and partner for organizations around the world in discovering what kids need to succeed. Mentoring Is a Core Life Skill. Coaching and the GROW Model on YouTube. 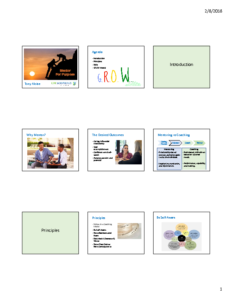 Contact us to get free access to our Mentoring 101 slides and lesson plan. You can see a preview with the file below.